My sister and I caught the Baby Queen Z’s cold, so we are all a tad miserable. Even though its a gorgeous day outside, colds and flus almost demand a good, homemade vegetable soup. When we were little, it used to be a chicken soup with matzoh balls, so I decided to make them and add them to the vegetable soup. Matzoh balls are a supremely comforting Jewish tradition – matzoh cracker meal, combined with salt, egg and a bit of soup stock to make dumplings. Eating them feels like being enveloped in a pure cashmere blanket. And when youre ill, they are very nourishing. I went vegetarian with the matzoh balls, though I did find good vegan recipes here and here. To be honest, I just wasnt up to trying the vegan version … not feeling focused or well enough to pay attention to multiple ingredients. But the soup is vegan – and I made it creamy and thick by whizzing it up with my immersion blender. Literally less than a minute and all those amazing veggies were pureed in a silken mass. I made the matzoh balls and boiled them in the soup pot (with the soup safely stored in a heatproof bowl) and then when they were done, introduced them to the soup. Good, healthy, nourishing and full of vegetable love. Sure to make us all better in a jiffy! In a large soup pot, over medium heat, heat the olive oil and saute the onion and leek until they go soft and slightly melty, and a little browned along the edges. This is quite important as they form the basis of the soup, so you want to cook them long enough to caramelise a bit. This can take up to ten minutes depending on heat source. Add the carrots, stir to combine, and let them soften, about three to four minutes. Add the zucchini, stir to combine and let it soften, about two to three minutes. Open a can of plum tomatoes in their juice, and pour over the soup base. I usually use one hand to hold and pour the tomatoes, and the other hand to catch the tomatoes as they fall into the soup and lightly crush them. Fill the can with water twice, and add to the soup pot. Stir everything to combine. Taste and lightly salt and pepper. Add the potatoes, rapini and spinach, and lower the heat to a soft simmer. Allow the soup to simmer for about 20 minutes, checking every ten minutes or so to make sure there is enough liquid in the pot. If there isnt, top it up. You can eat the soup just as it is – broth and wonderful chunks of vegetables. But when I am ill, I like a smooth soup, so I take it off the heat, and use my immersion blender to make a really thick silky soup. The choice is up to you. To be honest, you could use just about any cracker in this soup – saltines or oyster or water biscuits would all do. But if you have matzoh, use it – there is something very particular about this delicious taste that owes itself to the matzoh meal. Also, if you use salted crackers, adjust salt accordingly. This will make for quite a salty unboiled mixture. Dont worry. A lot of the salt will boil out in the pot. In a small bowl, combine the matzoh meal and the salt. In a separate small cup or bowl, beat together the eggs, oil and soup stock until combined well. Pour the egg mixture over the matzoh meal, and stir lightly to combine. It will be quite sticky and soft. 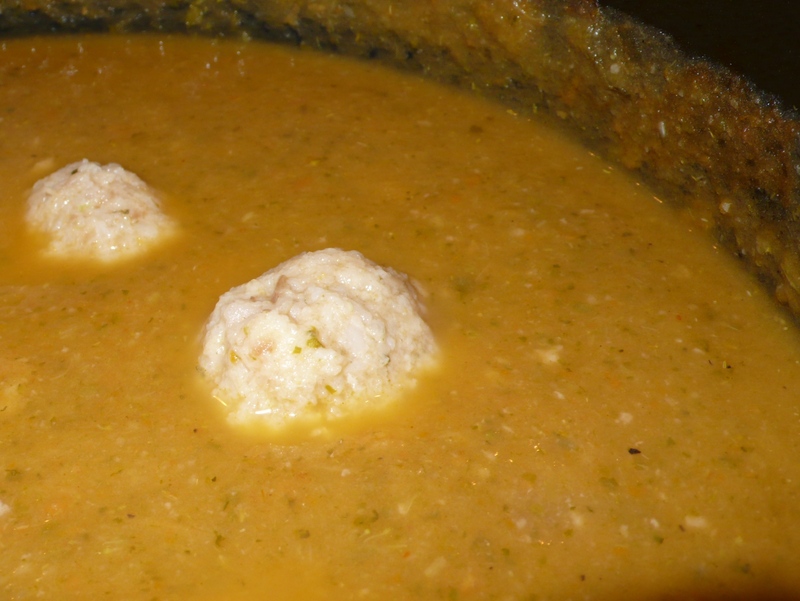 To boil the matzoh balls, transfer the soup into a large heatproof bowl. Its okay if a bit of soup remains – this will enrich the boiling liquid for the matzoh balls. Fill the pot with water, and bring to the boil. Take the matzoh mixture out of the fridge, and using your hands, make small balls (about 1 inch in diametre) and drop them in the boiling water. Remember that matzoh balls expand to more than twice their size, so dont make huge balls! Boil for 20 – 30 minutes, or until cooked through. You will know when they are completely cooked when you cut through one and it is light and fluffy all the way through, having absorbed enough water to cook the insides. Transfer the cooked matzoh balls to the soup, drain and rinse the pot, and transfer soup and matzoh balls back. Reheat gently. Eat and feel better!